1000 Roses Rosewater Mask Fruit stem cell complex and soothing rosewater instantly hydrate to nourish sensitive skin as pomegranate, hyaluronic acid, and aloe vera help revive for a flawless looking complexion. Aloe Barbadensis Leaf Juice*, Purified Water (Aqua), Rosa Damascena (Rose) Flower Distillate*, Vegetable Glycerin, Dicaprylyl Carbonate, Glyceryl Stearate, Cetyl Alcohol, Rosa Canina (Rosehip) Fruit Oil*, Punica Granatum (Pomegranate) Seed Oil*, Stearic Acid, Biosaccharide Gum-1, Plant Stem Cells (Alpine Rose, Malus Domestica, Solar Vitis) and BioActive 8 Berry Complex*, Vaccinium Macrocarpon (Cranberry) Fruit Juice*, Panthenol, Allantoin, Soothing Complex: [Sodium Hyaluronate, Magnolia Officinalis Bark Extract, Boswellia Serrata (Boswellin) Extract], Tocopherol, Bisabolol, Camellia Sinensis (White Tea) Leaf Extract*+, Hibiscus Sabdariffa Flower Extract*+, Phenethyl Alcohol, Ethylhexylglycerin, Rose Isolates, Vanilla Isolates, Pelargonium Graveolens (Rose Geranium) Flower Oil*, Citrus Aurantium Dulcis (Orange) Peel Oil*. 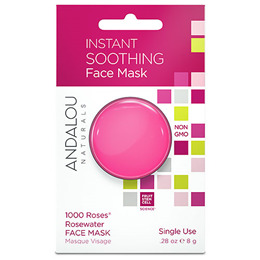 Below are reviews of Andalou 1000 Roses Instant Soothing Face Mask Pod - 8g by bodykind customers. If you have tried this product we'd love to hear what you think so please leave a review.